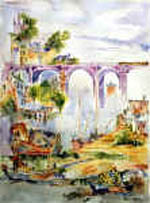 IN A MANNER NOT AT ALL DISSIMILAR o the way seventeenth and eighteenth-century European artists like Poussin, Fragonard and Turner recorded their feelings and view of the sights and beauties of the European continent, Matthew Moss, during his own Grand Tour, drew and painted these singular images. 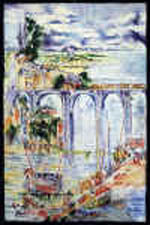 He painted the greater part of these works of art almost always out of doors and directly in front of the scene depicted. This may go some way to explaining their beautiful fresh clean colours, clear sharp forms and the almost surreal vision that they convey of the beauties of ancient European civilization. 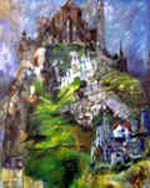 The Rock of Cashel, Ireland's Acropolis, is one example of the vision Matthew Moss conveys in the paintings of his native Ireland. 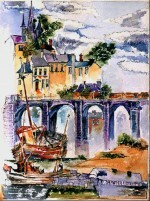 He paints the medieval Round Towers and ancient towns like Tallagh, Skerries and Balbriggan. Matthew shows us the beauties of the Principality of Andorra hidden between France and Spain, and fishing villages on the Mediterranean island of Corsica. 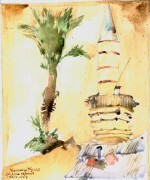 On one occasion, traveling by packet-boat, the artist’s journey reached the horn of Africa, where he recorded the elegant cargo boats, dhows, shown here in the port of Djibouti. 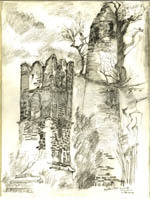 Medieval Round Towers of Lusk, Ireland. Over the centuries, the two medieval defensive round towers have, gradually, been incorporated into the fabric of this gotic church. The train passing over the 19th century railway bridge on its way to Northern Ireland. Overlooking the sands of the harbour, the town's Georgian and early Victorian buildings and church. The entrance to the sixteenth-century Venetian fortress is dominated by the imposing lighthouse. The impressive construction of the brick built railroad viaduct that, in the 19th century, for the first time, joined the ancient towns of Drogheda and Balbriggan to Dublin. The small medieval seaport north of Dublin with its prawn fishing boats beached on the white sands of the secluded harbour at low tide. 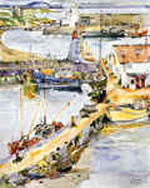 The canvas shows six moored Dublin fishing vessels with the mudbank next to the harbour wall becoming visible as the tide ebbs. Skerries, on the outskirts of Dublin, is a village of some antiquity with round towers and ruins dating from the twelfth century. The harbour gate is a late Georgian structure of a style common to Ireland. On the green rising hills in the background we see two stone built villages with red tiled roofs, the right one surmounted by a campanile. Some shadows from the boats are reflected in the blue sea in the foreground, broken up by ripples, traces of the mudbanks, and in the deeper sections, buoys bobbing in the water. 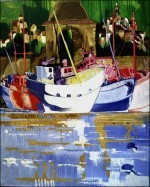 The overall appearance is one of highly saturated colours, particularly in the fight cadmium red of the boat on the left, the cobalt violet and madders of the centre section boathouses and the intense white hull of the foreground boat. These are foiled by the ochre colour used in the harbour wall, the sombre greens of the hills which continue to the head of the canvas, the verticals of the multicoloured masts and the earth coloured village. The intense movement of line and colour ends sharply at the waterline where relief is provided by the soft pastel blues, whites, ochres and ombers of the sea passage. Oil based pigment is used overall with a glaze of acrylic tint over the red of the boat on the left to add intensity and also to soften the primary colours and whites in the foreground. The texture of the surface is a notable characteristic of the painting provided by the use of a handwoven linen canvas of an irregular weave manufactured about two hundred years ago that the artist recovered on the back of an ancient painting. This is moderately primed with an acrylic white to preserve its irregularities which, upon close examination of the surface, are noticeable. 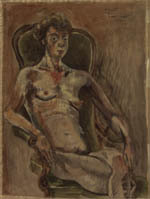 The painting was begun in Australia in 1979 on the basis of a double spread pencil drawing that Matthew made in Skerries some years previously. 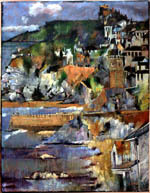 The hill villages derive from the gouache painting done about the same time, of the hill. village of Lingueglietta The artist made a subsequent drawing of the harbour archway to be incorporated in the final work but then not used. 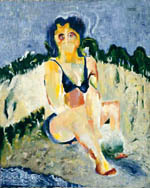 The painting was brought to a conclusion in February 1982 by the development of the green background and villages, and the application of a denser more impasto based pigment to the surface of the sea in the foreground. Seen from the opposite side of Skerries harbour, with the tide receeding, the slate roofed cottages snuggle in the soft green hills of the Irish countryside. 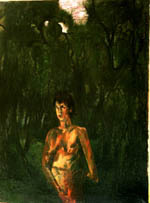 The figure in the landscape is based on a sepia drawing, (See Id no. 0304-0021-Female Portrait) in this collection. The landscape of olive trees was painted outdoors. The medieval 5th century fortress dominates the central plains of Ireland. 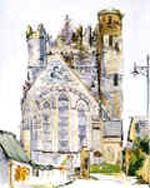 The Rock of Cashel is based on a watercolour that the artist did in the town of Cashel on 30th December 1988.. The imposing ancient monument is Irelands equivalent to the Parthenon at Athens or Mont Sant'Michel in France's Normandy. Like them it dominates the surrounding landscape. As a schoolboy Matthew bicycled from Dublin with a friend to visit the Rock of Cashel. In those days the scene was wild and overgrown and had a very Romantic look about it. It had not yet been taken in hand by the Irish Tourist Board (Bord Failté). Like two figures in a nineteenth-century antiquarian engraving the two schoolboys sat on ancient overturned gravestones, while contemplating the beautiful surrounding Tipperary countryside. The Rock of Cashel conveys, almost unconsciously, the wildness of the Rock of Cashel in Ireland's early 1950s. Dublin's ancient north-eastern seaport, known as the point where, in the 5th century, Irelands patron saint, Saint Patrick came ashore (with his goat). 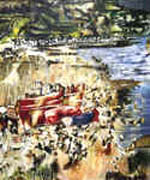 The artist's view, painted in-situ, of an important fishing port on the Spanish Basque coast. 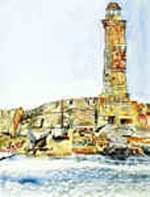 The painting was completed in this old seaport, in situ. 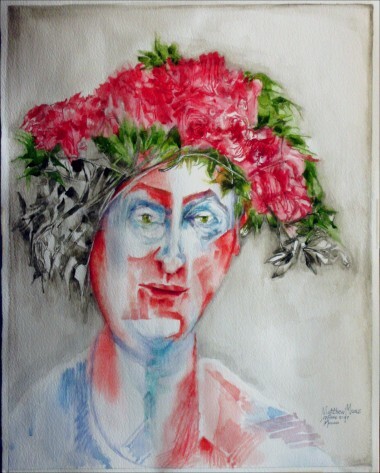 It is signed and dated on lower left on Fabriano watercolour paper. 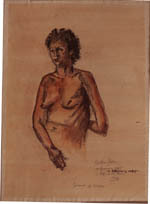 This watercolour fragment is a preliminary study that Matthew Moss intended should develop into a proposed oil painting on canvas of a figure standing against a Principality of Monaco landscape. 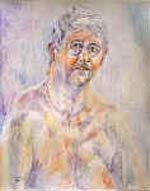 The head and shoulders figure study is the likeness of no specific person. Rather, the artist intended her to assume the characteristics of Renaissance Mannerism painting and, its extension, Italo-French works of the school of Fontainebleau. A visible characteristic of painting in that period is how the human figure mutated eventually from Michelangelosque realism to appear to be wearing masks. 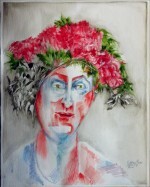 Mask are used in ancient Greek and Roman theatre and later in Japanese Noh, especially by female actors to stylize emotions. They are an important element in James Ensor the Oostende artist's paintings and were an influence in the creation of Moss' work of art.